Cost: The Truffle Menu consists of three courses, and costs £49.50, or with a glass of Moet & Chandon Rose and a glass of Dom Perignon, costs £119.50. The wine list is quite comprehensive, with entry level wines starting from £29.50, and wines by the glass starting at £6.50. About: With a shelf-life as short and sweet as the eponymous fungus season itself, Brunello Restaurant at The Baglioni Hotel is serving its special Truffle Menu only until 6th December 2015. I enjoyed my stay at The Regina Baglioni Hotel in Rome last year (reviewed here), and so was interested to check out their sister hotel in London. Having had a great time during my visit to the truffle auction in Alba recently (read more about that here), I was intrigued to see a white truffle menu on offer in London. Baglioni is one of the leading hotel collections in Italy, with properties throughout the country, as well as London, Marrakech, and it is about to open new hotels in south Asia. Part of the Leading Hotels of the World collection, The Baglioni London is situated a stone’s throw from the Royal Albert Hall, opposite Hyde Park. The interior is plush to the point of opulence, personally I found it a tad OTT, but there were plenty of people there who seemed to be having a great time and enjoying it. What We Ate: I don’t normally describe amuse bouche, but the one offered at Brunello’s was one of the best dishes on the menu. Truffled mashed potato was served with a poached quail egg - a lovely little dish heady with truffle aromas, and a sprinkle of fruity Espelette pepper. The menu proper started with freshly made tagliatelle with parsley, 36 months aged Parmesan cheese, melted butter and shavings of white truffle. I loved the simplicity of this dish, which accentuated the heady aromas of white truffle. The pasta was served al dente, the sauce well seasoned. To follow, we had Italian-style sliced beef entrecôte with roast potatoes and white truffle cream. Cooked medium-rare as requested, the beef was of excellent quality, very tender and flavoursome, so much so that I felt it masked the delicate flavour of the white truffle cream. I enjoyed the beef very much and the course as a whole, but could hardly taste any trace of white truffle. Dessert was two crunchy cannoli filled with chestnut cream, served with a classic vanilla and white truffle sauce. This was probably the best course of the dinner, the combination of vanilla and truffle in the sauce reminding me of eating a ripe durian fruit - sweet, perfumed, savoury and earthy all at the same time. What We Drank: We started with a glass of Alma Bellavista Cuvee Brut Franciacorta (£12.50 per glass, £58 per bottle). Franciacorta is becoming increasingly popular in the UK, and is Italy’s answer to Champagne, with many showing the toasty, brioche characteristics of the best Champagnes. Alma Bellavista was a rich, slightly creamy Franciacorta, made by the traditional method, and was an excellent match for the tagliatelle, butter and truffle dish. With the beef, we had a glass of Anna Maria Abbona, Dogliani Dolcetto Superiore, Maioli 2012, which like the truffles comes from Piemonte (£12.50 per glass, £49.50 per bottle). Youthful, fruit-driven and with gentle tannins, the mid-range option on the menu, this was more than a match for the flavoursome beef, but again we felt overpowered the truffle sauce. 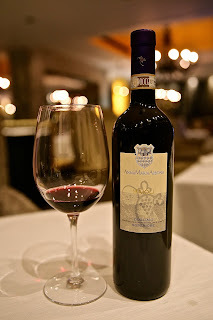 There were only 3 choices of red wines by the glass on the menu - the entry level was priced at £6.50 while the one above the one we ordered, a Brunello di Montalcino cost £25, which perhaps would have been a better choice for the truffle sauce. 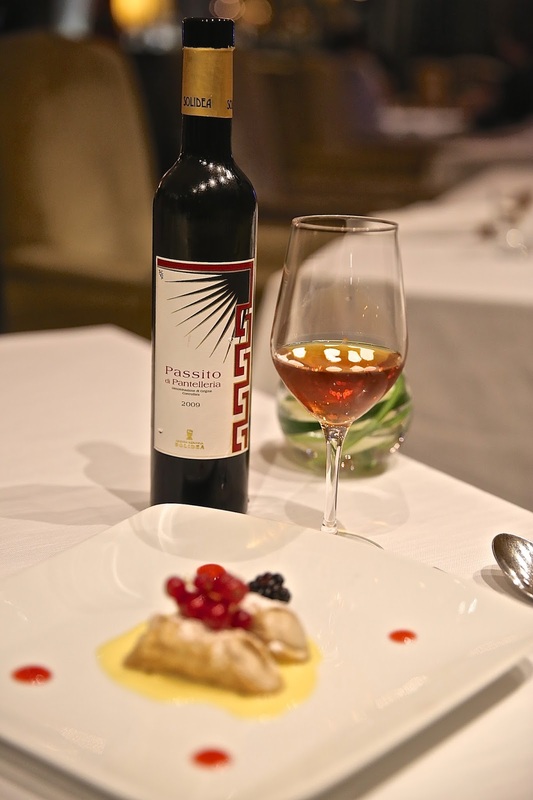 With the dessert, we had a glass of Sicilian Solidea, Passito di Pantelleria 2009 (£16 per glass). Served very chilled, this was a rich sweet, raisiny wine, and delivered a wonderful end to our meal. Likes: It's always a pleasure to drink Franciacorta, and there is a good selection at the restaurant. I loved the vanilla and truffle sauce in the dessert. Fantastic service. Dislikes: The opulent Italian decor may not be to everyone's taste. The beef, though excellent, was in my opinion not the best choice as a main course on a truffle menu - perhaps some simple polenta, gnocchi or risotto would have been a better accompaniment to the truffle. Verdict: An opportunity to try the fresh white truffles of Alba in a central London location, and at one of Italy's best hotel collections. At £49.50 for a three course truffle menu, it will not break the bank! Ahhh! We lost this great menu for one day only!